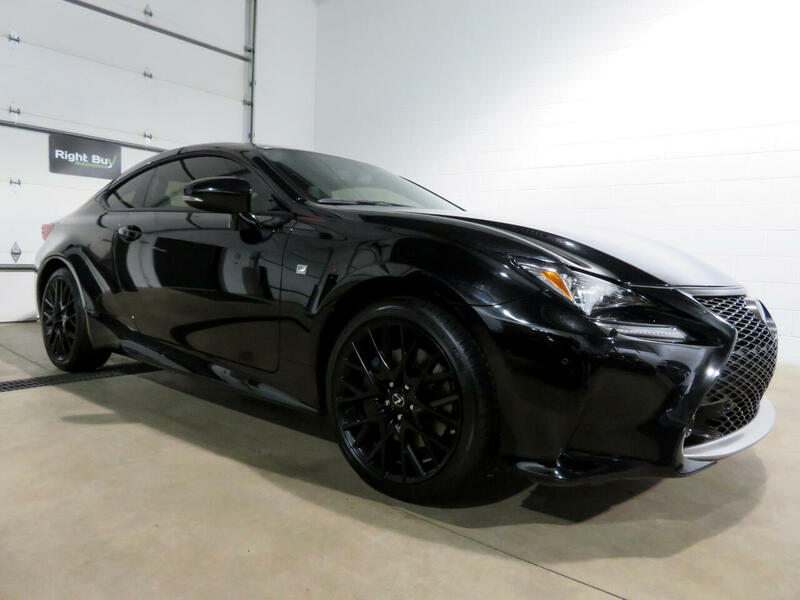 F SPORT CUSTOM WHEELS LEXUS ENFORM MOONROOF BACKUP CAMERA LFA INSPIRED INSTRUMENTS BLIND SPOT MON. One Owner. Dealer maintained and serviced. Fully inspected. Remaining warranty through Lexus. This Lexus RC 350 features the F Sport Package and Navigation Package. Some of the features included are 10 way driver and 8 way passenger power heated and ventilated front sport seats; heated steering wheel; dual zone front automatic climate control; Lexus display audio w/7 inch VGA screen and 8 speakers; Lexus enform app suite; HD radio; F Sport badging; aluminum sport pedals; LED headlamps; gloss black chrome trim delete; 19" F Sport gloss black aluminum alloy wheels; F sport tuned suspension; bluetooth; LFA inspired instrumentation; rear backup camera w/ cross traffic alert; blind spot monitor w/lane change assist; day/night auto dimming rear view mirror; proximity key for doors and push button start; variable intermittent wipers; rear lip spoiler; sunroof; all wheel drive and much more. Every vehicle at Right Buy comes with a full inspection report, CarFax vehicle history report, affordable extended warranty options and low rate financing options. Set an appointment to view the vehicle in our heated indoor show room. 4 YEAR 100K MILE BUMPER TO BUMPER EXTENDED WARRANTY AVAILABLE FOR $1,460 or 8 YEAR 120K MILES FOR $1,790. Message: Thought you might be interested in this 2015 Lexus RC 350.